When her aunt Shirley dies, Dawn finds herself back in her claustrophobic home town in Northern Scotland for the first time in years. She spends her days caring for her small daughter, listening to tapes of old country songs and cleaning Shirley s flat, until one day she comes across the key to a cupboard that she was forbidden to open as a child. Inside she finds an album of photographs, curling with age. A young couple pose on a beach, arms wrapped around each other; little girls in hand-me-down kilts reveal toothless smiles; an old woman rests her hands on her hips, her head thrown back in blurry laughter. But why has her aunt treasured these pictures secretly for so long? Dawn’s need for answers leads her to a group of Travellers on the outskirts of Elgin. 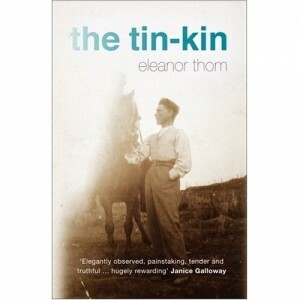 There she learns of a young man left to die on the floor of a cell, and realises that the story of her family is about to be rewritten… Weaving between narratives and decades, ‘The Tin Kin’ is a beautiful moving novel about love, hardship and the lies and legends that pass between generations. It is a striking, unforgettable debut.